In the week price, supplement of 35.00 €, including the housework and the change of sheets and towels, twice in the week.The studio must be made clean if the 35.00 € supplement is not taken. 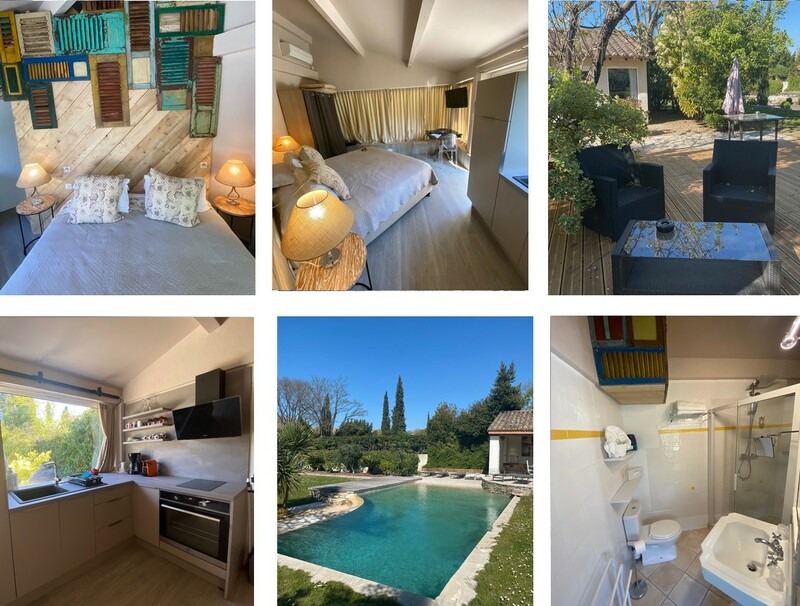 Situated between the Alpilles and the Camargue, Le Moulin d' Aure is the ideal place to experience the true Provencal life. Enter on a driveway which passes through a stand of centuries old pine trees and leave the world behind. The olive grove which greets you tells you that you have arrived at Le Moulin d'Aure. Enter the world of le Moulin d' Aure. Discover the Batisse and le Mas which compose le Moulin d'Aure . Provencal traditions of old tiles, iron work and colored quilts have all been respectfully used in the decorations of your home away from home. It is now the home of your friends, and you are their guests. Here the owners will welcome you in the finest Provencal traditions with a sunny and friendly Italian accent.And they will share with you their philosophy of genuine hospitality, the very best of gastronomy which is a fine blend of Provence and Italy and the finest of wines from an exceptional wine list.